Tom arrived at ten by which time I had walked Mix and sorted some presbytery emails. 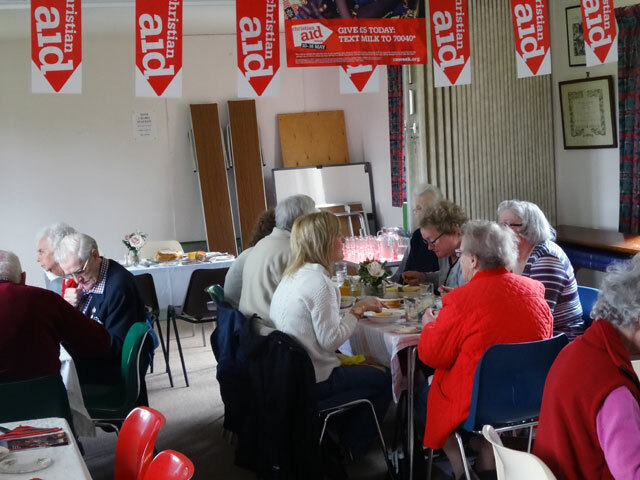 We loaded our Christian Aid materials and all we needed for the lunch into Tom’s car and went off to Gavinton Church Hall. The soup was on the cooker by ten-thirty, the tables and everything was set out by eleven and balloons and posters decorating the hall and the Church gates soon afterwards. We had time for a coffee and then our first customers arrived about twelve-fifteen. We had a good crowd, served vegetable and butter-nut squash soups, lovely bread and several varieties of cheese. Dorothy and Rachel arrived to help us serve and we had a very happy time, using the Christian Aid meditation books for a short act of worship. It didn’t take us too long to tidy up and then it was time to come home. Mix was waiting for me, anxious, I suspect, to be away from the puppy and anxious to know that he was still number one dog – which, of course, he is. Together we went for a walk and then came back to the Bothy (Mix and my special place) where I dealt with emails and presbytery matters while Mix looked out of the window. We dined in the farmhouse and again settled down in the Granary in the evening – Rachel, me and our three dogs. I have developed the skill of relaxing in front of the television and doing nothing else at all; Rachel always has to be busy so she was working away at her kilts while I lay on the sofa with Mix. We walked the dogs – Bramble doesn’t go out other than to the garden: this will remain the case until she has had her injections next week – and then, after watching the News, we went to bed.